This is a kind of a crazy one. I picked this up blind at a record show a while back on the strength of the song, a cover of one of my favorite Jackie Wilson records ‘I Get the Sweetest Feeling’ (which was co-written by one of the great soul songwriters, Van McCoy)on the assumption that it was a soul group. When I got the record home and gave it a spin I was pleasantly surprised to discover that Earth Quake wasn’t a soul group, but in fact a rock/power pop band. 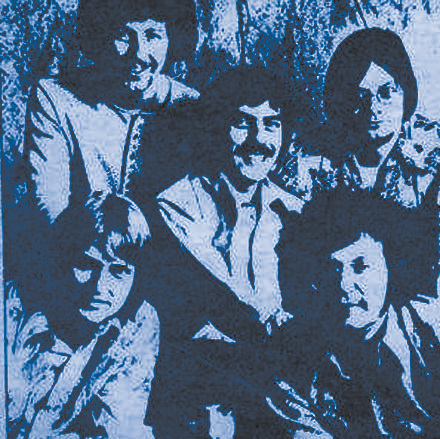 They formed in the mid-60s in San Francisco as Purple Earthquake, and recorded two albums for A&M in the early 70s before joining up with the nascent Beserkley label where they would record four albums between 1975 and 1979. Their version of ‘I Get the Sweetest Feeling’ is a really cool fusion of pop/soul (something at which McCoy specialized) and Beatle-y rock. They play the song fairly straight at the beginning, but the chorus puts a slightly modern twist on things, and then at around 1:42 drop in an instrumental break that sounds like it was lifted from a 1965 Beatles session. I’m not really familiar with their later stuff, but on the strength of this single I will certainly pick it up when I find it. Iron Leg for the Night Train: It Freaks Me Out! The mix you see before you is the end result of an invitation from the folks at The Night Train Radio Show in the UK (it ran on their show this past Thursday). I had done a guest mix in the Funky16Corners/soul stylee last year, and at the time they asked if I might return with something a little Iron Leg-gy. 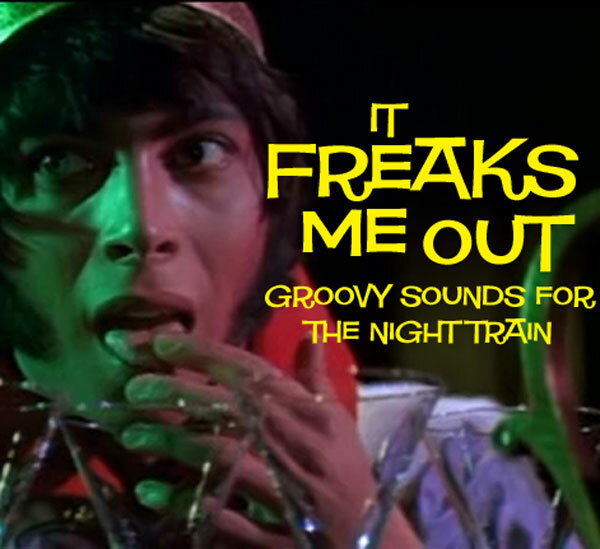 That mix is ‘It Freaks Me Out!’, 30 minutes of hot garage and pop 45s (and a couple of album tracks). There are lots of homegrown heaters, as well as a couple of very nice international treats. Last week saw one of the first musical losses of 2017, British singer/songwriter Peter Sarstedt. Though not very well known here in the States, he had a huge hit in the UK (and internationally) with ‘Where Do You Go To (My Lovely)’ in 1969. It was that song – which had the sound of early Leonard Cohen, with a very healthy dash of French chanson – that brought him some new level of fame when it was used by Wes Anderson for the soundtrack of ‘The Darjeeling Limited’ in 2007. 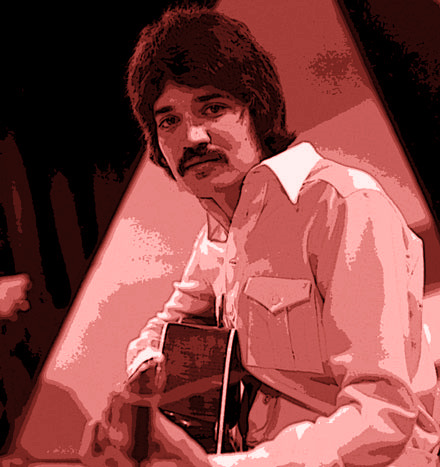 Sarstedt was born to a British family in India, and started in a skiffle group with his brother Clive (later known as Robin) Sarstedt, and their older brother Richard was a pop star in the UK under the name Eden Kane. 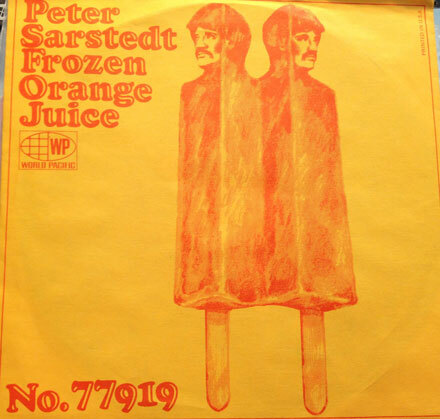 Today’s selection, ‘Frozen Orange Juice’ was Sarstedt’s follow-up hit in the UK, making it into the Top 10. 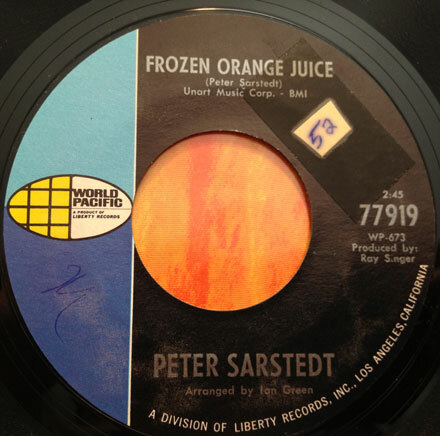 ‘Frozen Orange Juice’ has the feel of some of the records by the Bee Gees or Tom Northcott from the same period. It has a wonderful arrangement – by Ian Green, who also arranged Sharon Tandy’s epic reading of ‘Our Day Will Come’ and Rosetta Hightower’s classic cover of Eddie Floyd’s ‘Big Bird’ – will all kinds of interesting touches. Sarstedt had an engaging tenor, and a great way with lyrics. The flip side, ‘Aretusa Loser’ has a looser, boogie feel to it that suggests a slightly later, pub rock feel (maybe even a little Stealers Wheel). Sarstedt never had another big hit, but continued to record through the 70s and 80s, including a collaboration with his brother Clive. He continued to perform until his retirement (due to illness) in 2010. 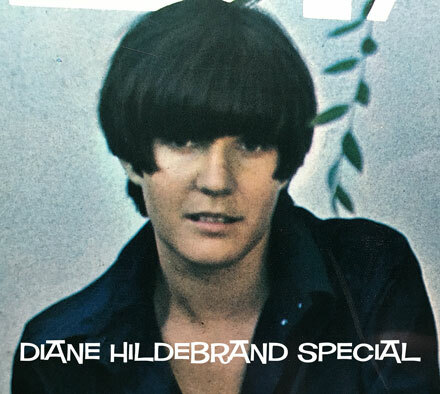 We have a very groovy, unusual one for you this month, all running back to my digging the great (and sadly, only) album by Diane Hildebrand, and my ensuing trip down the rabbit hole discovering her extensive songwriting catalog, much of it tied to the Colgems operation. There are a lot of very cool things in here, including a bunch that might surprise you. The record I bring you today was a kind of a mystery to me for a while (still is, kind of). I picked it up a while ago because it had a cover of my favorite Crosby, Stills, Nash and Young song – ‘Everybody I Love You’ – on it but ws unable to track down much information on the band. 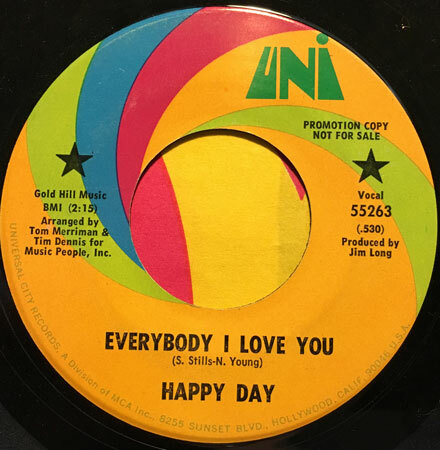 That their name – Happy Day – was a fairly common phrase made them largely un-Google-able, and the fact that their three 45s contained more covers than they did group originals made for a very faint trail indeed. I was finally able (after a couple of false leads) to figure out that the band was based in the Chicago area. They recorded three 45s for the UNI label (some of which may have been released locally first) in 1970 and 1971. Their version of ‘Everybody I Love You’ is a pretty faithful cover of the original, with some nice lead guitar and harmonies. The flipside, ‘Retribution’ is Chicago (the band and the region) style horn-rock. Strangely enough, they appear to have recorded their 45s in Texas. I don’t know if UNI was dragging bands down there at the time, but they are listed in a Billboard directory as having recorded at Studio III in Dallas, and the producer of one of their 45s, Norm Miller produced Texas acts like the Southwest FOB and the Gasoline Powered Clock. If anyone has any more info on the group, please drop me a line in the comments.